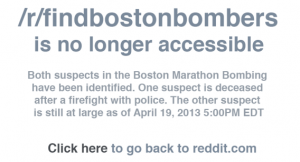 In the last two posts, we have analyzed what happened after the bombing of the Boston Marathon. The FBI launched a crowdsourcing initiative that worked, but at the same time, another initiative emerged from the crowd just becoming a witch hunt. The question that arises, and that we began to explain in the second post is: why?. It was found that the task, the medium used and the existence of a supervisor were crucial elements. In this last post we will see another crucial element and some brief conclusions are going to be explained. The nature of the information with which the crowd has to work and perform the proposed tasks is one of the fundamental points. When the crowd works with sensitive information and doesn’t use it the right way, this situation can be dangerous. In the both cases we are talking about, the curious thing is that the type of information is the same: photographs or videos of the same time and place. In the case of the material given to the FBI, its sensitivity was unknown. Maybe there were many faces in the pictures but none was of any faulty or suspect. People who contributed with the images didn’t know who might or might not be a “person of interest”. In the case of the material supplied by the crowd and uploaded to Reddit, the sensitivity of the material was assumed. If someone uploaded and commented a picture, was because it was a picture of possible suspects. The issue of the information nature at crowdsourcing initiatives is well known, in fact, is one of the keys that can make a task to not be suitable to be done with crowdsourcing (because its private or personal nature). The problem appears when companies or people can’t differentiate between the information of sensitive nature and the normal info. Many companies could benefit from the application of crowdsourcing in different areas, but don’t do it because they are afraid that some one could make misuse of that info (sometimes justified fear, sometimes overzealous). The main conclusion is clear: uncontrolled crowd is likely to become a mob (defined as “crowd of people confused and disorderly”). This is why the figure of the crowdsourcer is so important in crowdsourcing. Crowdsourcer is who gives this control (or at least try do it ). Secondly, we can see how there are tasks that you better not make a crowd. Any task that involves a value judgment, in which can intervene prejudices or preconceived ideas, it should be better done by specialists. Not necessarily because being a specialists the results is going to be better, but at least, if the job is not well done, you can claim to him, something that you can’t make to a crowd. Many wonder if this type of investigations should be avoided, but the truth is that these pseudo-investigations on the Internet are unstoppable and inevitable. The reason is that a very strong intrinsic motivation comes into play . In this sense, the agent DesLauries expressly asked people to not use more than the pictures provided officially to proceed to the identification of suspects. However, an intrinsic motivation that inspired hundreds appeared. In this case, intrinsic motivation certainly varied among different participants: the need for security, a sense of empathy that made people strive to further resolve the situation, even anger because the injustice of any bombing. In any case, a motivation that moved the crowd in a different direction to that suggested by the authorities. Can we say that it was a motivation that made the crowd to be less intelligent? Next Post:PhD dissertation defended and “doctor” degree achieved. Doctor Estellés-Arolas.